All the students walk through the doors of our schools. The ones who have shelves filled with books. The ones who don't have a book to call their own or a notebook or a pen. The ones who have models of readers and writers in their lives. The ones who don't. The ones who come to first grade confident they can read and the ones who don't. The ones who come to school as native English language speakers and those whose native language is not English. The ones who come from hard places whose walls of mistrust and fear must be broken down or at least chipped away at so they can learn to their fullest potential. No matter which students walk through our doors, we are responsible for ensuring that all students thrive as literacy learners. All the students. Much of our students' lives are beyond our control. We can control what happens from the time students walk in the door in the morning until the time they leave six or so hours later. We can teach with a sense of urgency and purpose, hold high expectations for all our students, and provide quality instruction focused on students' strengths and designed to move them forward. 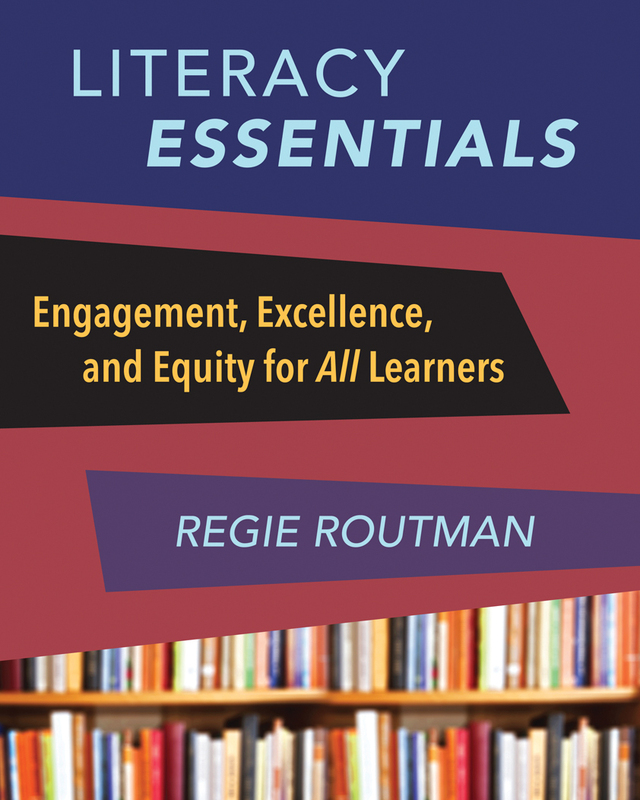 I have been reading Literacy Essentials: Engagement, Excellence, and Equity for All Learners by Regie Routman. I previously wrote about the first two sections of the book, "Engagement" and "Excellence." The third section, "Equity," may be the last, but it is no less relevant to our teaching or inspiring than the sections before. In fact, this may be my favorite chapter as it sparks thinking about how we can expand the possibilities for all our students. Regie states, "All children, regardless of where they live or life circumstances, are entrusted to us so we can do everything within our power to help them succeed - academically, socially and emotionally" (p. 254). It's our job to make learning equitable for all the students who walk through our doors, and this book shows us ways we can do this. There are many ideas and suggestions for action throughout the section of this book, but these are a few of my takeaways. Implement a curriculum that is designed to hold all students to high expectations. Rather than teach skills in isolation, teach them in context and in relation to the big picture of the authentic literacy work we would like students to be able to achieve. Students' strengths and their interests and passions are the foundation for their growth as literacy learners. Uncovering these will support students as they grow in their confidence and develop a love of learning. Implement assessments and use data responsibly. With formative assessment, we can discover students' strengths and target their needs. Data from assessments is only useful if it is used to make decisions about students' learning that will help them improve upon their skills. Our high-poverty schools need our strongest teachers and as many resources as low-poverty schools. Be an advocate for providing access to books and supplies for those students who need it most. Literacy Essentials is a book that belongs in the hands of all those responsible for the literacy learning of our students, both teachers and administrators. I've written about all three sections of the book, but I have only touched upon the wealth of ideas within its pages. There are many suggestions for actions that can be taken to provide the best literacy learning opportunities for our learners. Read the book and you will be inspired. Because I believe that literacy educators will be inspired by reading this book, I am giving away one copy. Comment on this blog post by Thursday, July 26th, 2018 and I will randomly select one person to whom I will send a copy of the book (U.S. addresses only please). Be sure to include a way that I can contact you, such as an email or twitter handle, if you are the person selected. Thanks for summarizing key aspects of the Literacy Essentials. I would love to have a copy of the book to read before school starts in September. Thanks for sponsoring the giveaway! I'm really looking forward to reading this book. When I began teaching, I had the good fortune to be put in a room next to a phenomenal teacher. She brought over Regie Routman's book Invitations, and told me this would be my bible and I needed to get a copy. I did, and it was. I'm taking Literacy Essentials with me to Disney World, then to visit my parents for a week, and will have time to read and think about my instruction as I read this book. I'm looking forward to it! Thanks for your thoughts on these sections and for your blog! I'll definitely be returning!